Peter has conceived his sculpture as an elephant. It has an ear [the bigger loop on the right] to hear with and an eye [the smaller loop on the left side] to see, and the central vertical line is its trunk. But the wider point he is making, through the metaphor of the wise observant elephant, is that to understand things properly we need to take the time to observe them and to make use of the senses we have. 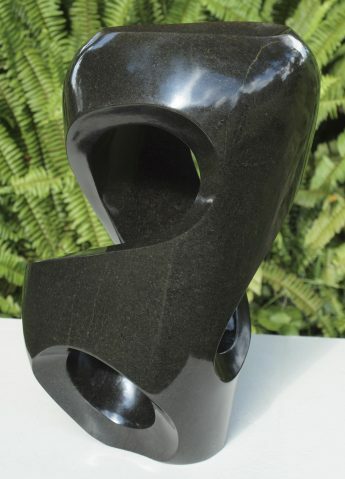 This stunning smaller sculpture is excellent value for money for a unique work of art. It is fundamental for Guruve that our smaller pieces are of equal quality to the larger pieces, so customers with a smaller budget do not have to compromise. It would also make a stunning gift. 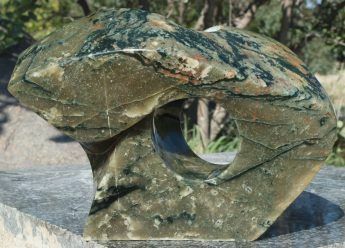 Springstone is the local Zimbabwean name for a very hard variety of serpentine stone. It is an excellent sculpture medium: it has a dense, even internal structure of small grains of rock with very few flaws. It is therefore perfect for Peter’s technically challenging style.